The record company has been kind enough to send us a freebie, so here’s a quick review of the Purpendicular reissue. The new edition comes in a fold out digipak with redesigned booklet. Gone are the lyrics, gone is the foldout. The new booklet is a traditional format, with new liner notes written with the benefit of a hindsight by Malcolm Dome. Despite the slightly confusing notice “Digital remasters © 1996 Sony Music Entertainment UK Limited”, it appears to this pair of ears to be identical to the original master. Not that the original needed any improvement. Bonus tracks are Don’t Hold Your Breath, originally appearing on the Japanese and US editions of the album, and a single 4:35 edit of Sometimes I Feel Like Screaming. Verdict: the 2014 edition serves single purpose of keeping the album in print. It’s probably not worth a purchase if you have the original. Otherwise it’s a must have as it is a truly seminal album in Purple history. Posted by Nick Soveiko on Tuesday, July 1st, 2014, filed under Blog. You can follow comment on this post through the RSS 2.0 feed. You can leave a comment below, or trackback from your own site. I still have my japanese edition of way back. Bought it secondhand for 12 Euro. Purpendicular is a Spectacular album!! One of my all time favorites, of any artist! One of my favorite Deep Purple albums! How boring! A great record.one of the best with Steve Morse. But seriousley? Something more than this should be available from this sessions? What a great album ! What’s the difference from standard release ? It’s not record company, and you shouldn’t be surprised, you should be sent piles for just existing all these years. That picture of Gillan was the front cover the tour programme. I don’t see a compelling reason to buy it so far. I’m not a collector and I have a perfectly good copy already. Love this record. Not a bad track on it. My favorite dp album and I’ve been following these guys many years. Saw them on the PS and HOBL tours as well as all the Morse era tours!! 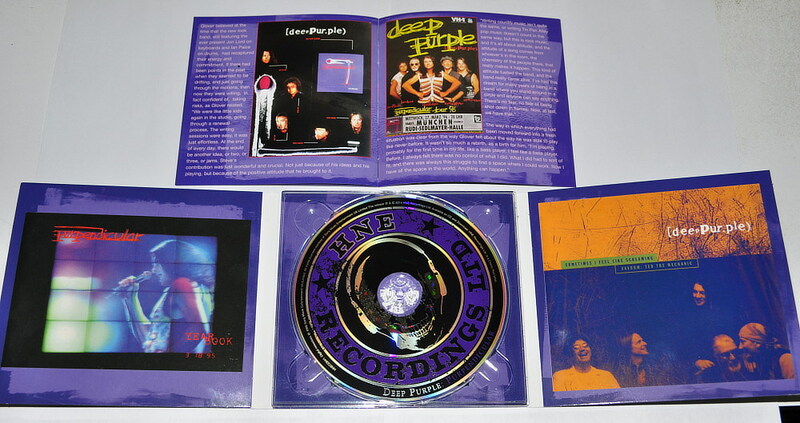 Purpendicular is my favorite DP album… hands down! So the teaser’s itself is wrong. Is it worth for a free copy?.. Should have include the verdict. The most underrated Deep Purple album. In my opinion Purpendicular equals or even eclipses some of the Classic Mark II albums and Burn. I wish tracks from this album were regularly included in the Band’s set list. One of the BEST albums of the 90’s along with UFO’s Walk On Water. Please. Quando vierem ao Brasil toquem SOMETIMES I FEEL LIKE SCREAMING. Don`t hold your breath is my grandson`s absolutely favorite song. He heard it once in my car and get`s fascinated at the age of 3. He still loves it with 4.5 year now. Would be nice to have it on a official CD release – and I would highly appreciate if they have added the original lyrics of this song to the already known – but this seems to be too much work – unbelievable. El librito? No es remaster? Think this is my favourite Morse era album. Like the sound, feel and production, solid and cohesive, some nice surpises but plenty of the classic Purple groove. Quality! just bought it, one of the best albums of the morse era. Yes, certainly a great re-release in a new layout. Maybe next time in about 20 years in the next re-release of this. I recall Roger saying that there was a LOT of left over material from these sessions (jams etc), so it’s a shame non of that has been included. I guess we’ll just have to wait for the 30th anniversary edition! They should have put a few bonus live tracks from the Perpendicular tour on it. That would really increase sales. I know I would buy it. Like it says above there’s probably no reason to buy it as long as you have the original. I have the US version so Don’t Hold Your Breath is on it. 28/03/1999 Aramaçan Santo André city São Paulo state Brasil. Purpendicular Tour. Fantastic. Alguma previsão para o Brasil ainda este ano? Please. Mandem alguma resposta. Great vibe and great ideas just needed tidying up by an Ezrin and a little quality control. @20 Drdp, Amen to that. Purpendicular and Walk On Water continue to ride shotgun the most out of the countless records in my library. Bought Walk on Water the night I was lucky enough to see them at the Birch Hill Inn in NJ during that tour. Apparently Michael threatened to quit the night before in Cincinnati, but thankfully a cooler head prevailed…. Thank you # 20 and 34! I just listened to ‘Walk on Water’ yesterday and the day before and still love it! Reminds me of DP’s Perfect Strangers as it is a comeback album with standout tracks and filler tracks which are still good! Met Schenker for the first time at the Boardwalk in Sacramento, CA during this tour and many times since then. Why do a lot of people say Michael is difficult and not friendly? Could’nt wish for a nicer guy! Love his solo on ‘Dreaming of Summer’. Understated feel and just slowly played choice notes (like BB King but better)! Went to catch UFO a second time at the same place a month or so later and found out after driving 80 miles that Schenker quit the night before! I see no compelling reason to purchase this release. But, let me be clear, this is a great post RB recording. The band refound themselves as a band who still had life and, because of what had just gone down, something to prove. Anyone who doesn’t have Purpendicular in their collection should add it. I remember a radio interview with Roger a few years after this came out. He said that if they ever did a reissue of this, there would be plenty of extra material to choose from, because they wrote and recorded tons of extra stuff during these recording sessions. So…where is it?? The perfect mixed of classic purple with Morse’s unique style. It far better than Bananas/Now What!. @ #’s 20,34,and 35. After reading your comments I had to go and get Walk on Water, which even though it sems to be a bit of a rare bird, is a lot easier to find with the internet. Got a copy and am listening to it here at work as I write while on break. It is a terriffic album and I think that I will be listening to it often. I missed out on a few things back at that time due to lack of fun income while getting out of debt so it is nice to discover them now! Since this thread started a couple of weeks ago I wonder if you will find my thanks for the tip? Thank You! The first album without the real Purple guitar player. I will on a good day give it 3 out of 5 stars. I played Walk On Water to pieces. I wonder what style the new album will be. Not surprisingly the band has wondered off from the heavy rock style to something else, I d not call it heavy rock anymore. If this goes on, they ll keep on making albums, every time a bit softer and duller. Really Priest? Again? I seem to remember you being a cat lover and actually having a cat. Goes with your constant nagging and nagging and inability to get over your lost lover…. TMIB. Might be time to get another cat. Nothing like sitting in a chair with a furry little kitty cat on one’s lap, listening to Heavy Rock. Especially when somebody else walks over and cranks up the volume full blast really fast, causing said cat to freak out, clawing at the area where your balls once were trying to escape. Bet you could give Ian Gillan of old a run for his money with that high pitched scream you would be belting out. Actually, Tracy(I thought I told this before)I now own 4 cats and they did get used to my taste in music. They sleep in a box near my computerspeakers. They must like me a lot! I did have a good ability in matching Ians screams years ago but somehow, after my biggest crash ever around 2007. I never really recovered. I seldomly sing nowadays wheras I did so on a regular basis before. I ve been trying hard to cope with serious ailments, including that lower back and a Fybriomyalgic kind of muscle pains since 2008. The time of acceptance should have come , but Im very stubborn by nature. I m still hoping to find a moment from where i can rise again.